As the Asia-Pacific region continues to grow in global importance, stakeholders in Australia, China, Hong Kong, Indonesia, Malaysia, New Zealand, Singapore and Vietnam perceive good governance as an enabler of economic growth, while a majority in China, Indonesia and Vietnam expect market and corporate governance to improve in the future. That's according to a new survey that explores a wide range of corporate and market governance issues. 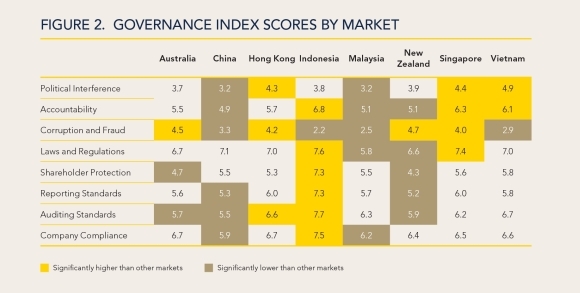 The CPA Australia Asia-Pacific Governance Survey covers market and corporate governance issues across eight markets – Australia, China, Hong Kong, Indonesia, Malaysia, New Zealand, Singapore and Vietnam. More than 1200 stakeholders - split between shareholders, professionals and business owners -and management executives participated in this research. The survey is designed to give regulators, market participants and other stakeholders an insight into perceptions of how local markets work and provide comparable data across eight different jurisdictions in the Asia-Pacific region. It’s important that differences between markets are understood in relation to the local environment, political landscape, size and scope of the markets involved, and the maturity of the respective stock exchanges. The full survey report - including a breakdown of further key findings - can be accessed here.